The Lady 8 shrinks into a petite format dressed in mother-of-pearl or scintillating blue aventurine. 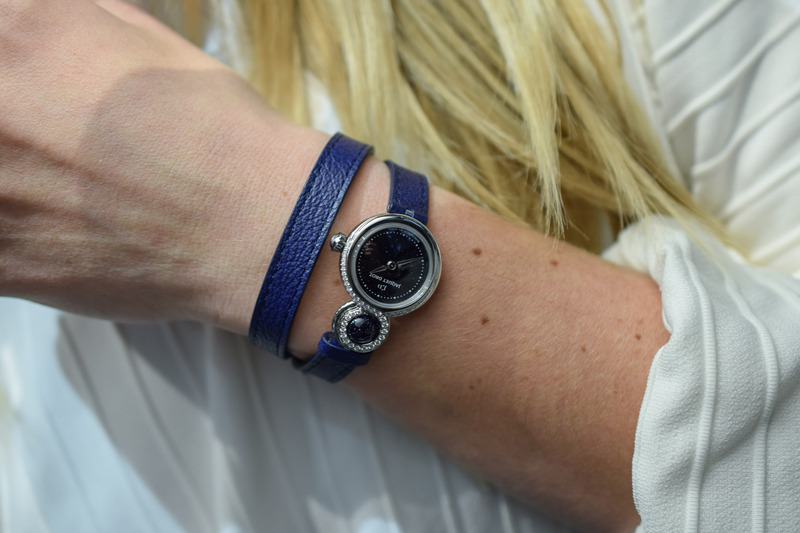 Jaquet Droz is all about sensory delights. 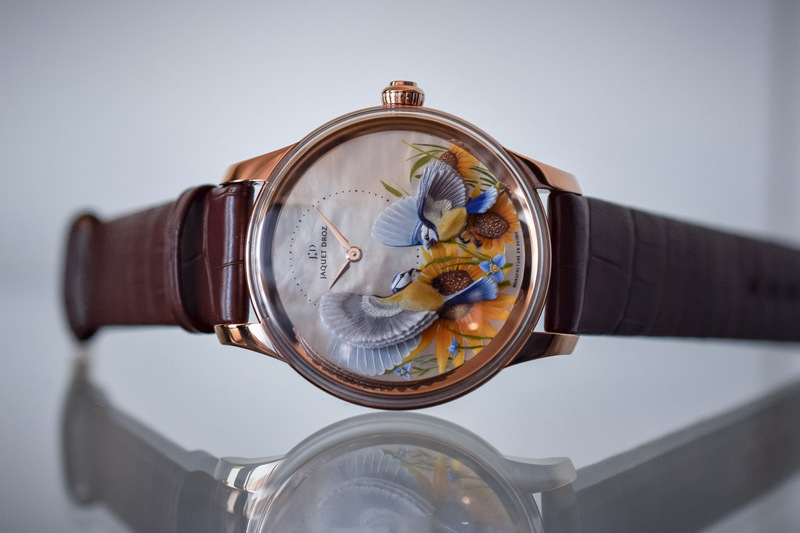 From exquisite enamel dials and the pursuit of rare métiers d’art to animated automata like the chubby gold cherub being drawn by a butterfly chariot and chirping birds on minute repeaters, this is one brand that knows how to engage the senses. The Lady 8 plays on the sensuality and symbolism of the figure eight and is revisited in 2018 in this delightfully petite model with a sparkling blue aventurine dial or a glamorous red gold mother-of-pearl version. 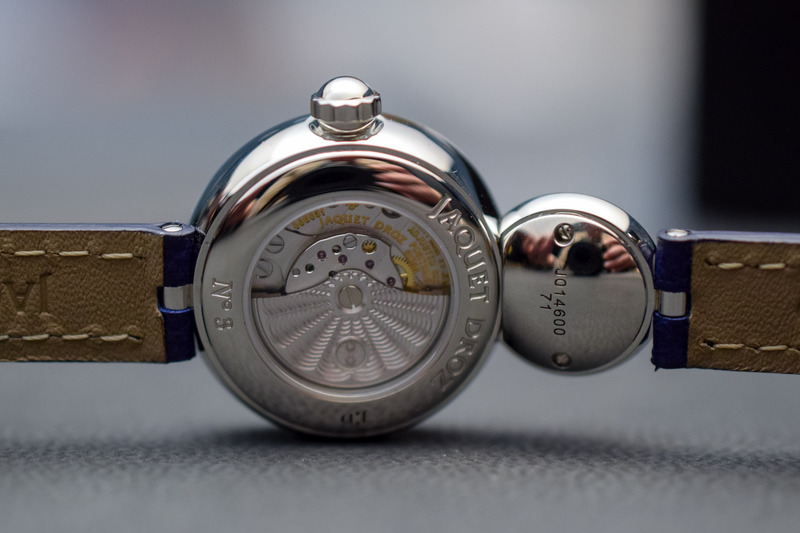 Fitted with an automatic movement, the diameter of the case measures a dainty 25mm and the watches feature a spherical ball at noon that rolls smoothly under the finger. 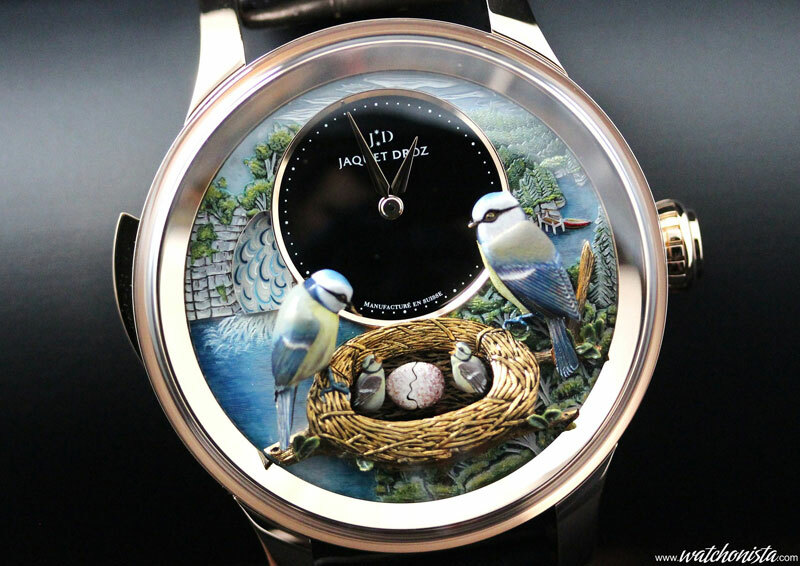 Jaquet Droz has a genuinely rich brand heritage and, since the 18th century, is the byword for automata – those magical mechanical marvels (singing birds, musical snuff boxes, etc.) 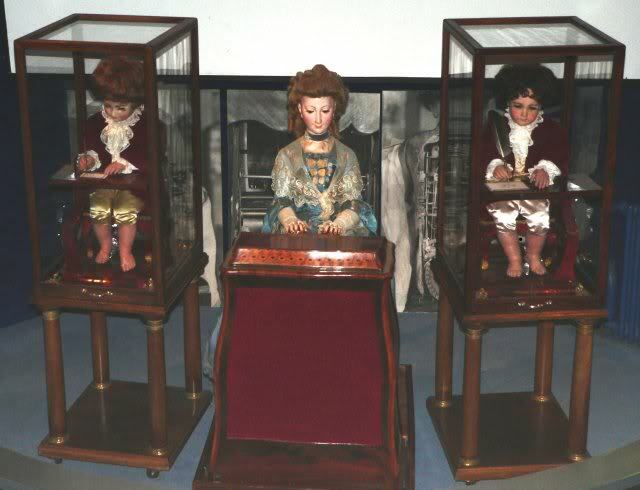 that delighted the royal courts of Europe and are treasured museum pieces today. China’s Imperial Court got wind of these extraordinary animated mechanical wonders and more than 600 pieces were ordered by the Qianlong Emperor and the Mandarins over a period of ten years. Pierre Jaquet-Droz was, in effect, one of the first European clockmakers to import products to China. This special relationship with China persists to this day and many of the brand’s signature designs have a connection to the Far East. 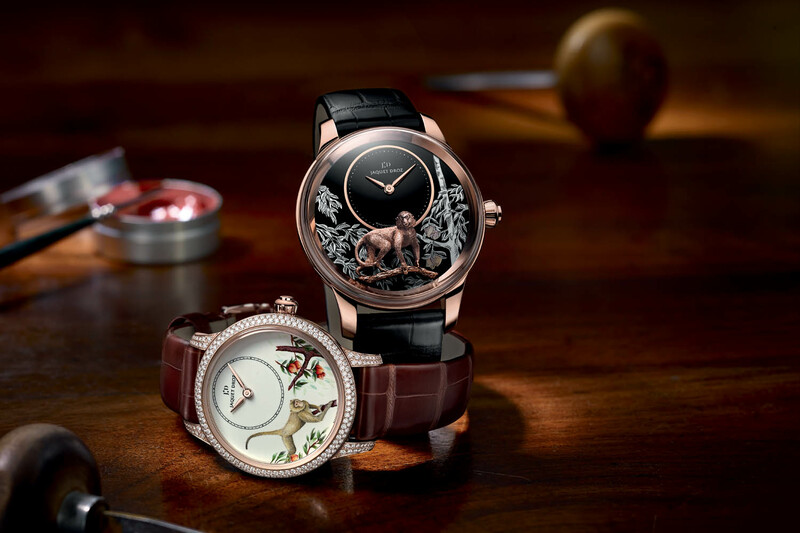 The use of the number 8, regarded as the luckiest number in Chinese culture and a symbol of infinity, has become a leitmotif at Jaquet Droz along with symbolic Asian flora and fauna such as the lotus flower and butterflies. When Jaquet Droz was acquired by the Swatch Group in 2000, designers were enthralled by a particularly elegant Jaquet Droz pocket watch of 1784, which inspired the creation of the emblematic Grande Seconde in 2002. With its hours and minutes counter and intersecting small seconds counters forming a figure eight, the refined design has become a cornerstone of the brand’s revival. 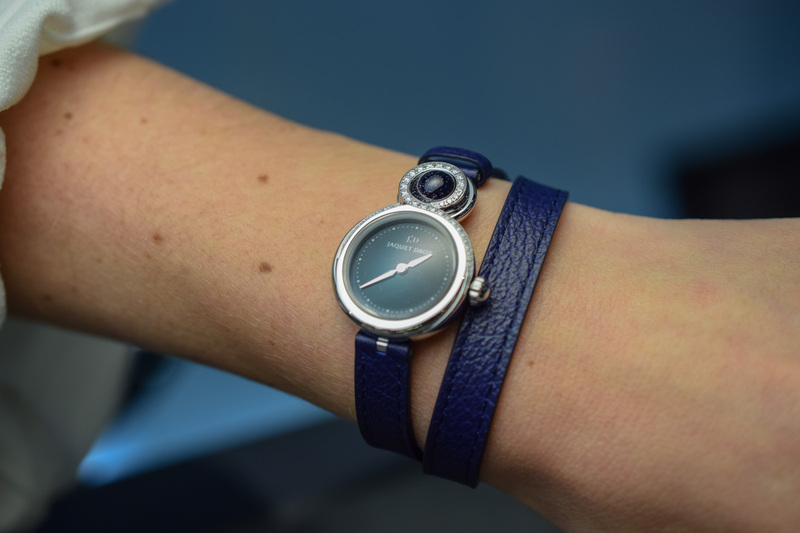 Jaquet Droz is also renowned for its use of semi-precious stones and the midnight-blue dial of this model looks like it has been sliced straight out of a clear night sky. Sparkling with twinkling stars, the dial and the upper segment of the number eight case is set with aventurine glass. Not aventurine stone, but aventurine glass (also known as goldstone), which was purportedly discovered by an 18th-century glass blower in Murano when he accidentally dropped some copper particles into molten glass and noticed how the glass started to sparkle. In this case, the blue aventurine is enhanced with cobalt or manganese to acquire the silvery speckles. Housed in a 25mm stainless steel case with a height of 9.60mm, the watch is set with 41 brilliant-cut diamonds framing the sphere at noon and covering half of the bezel on the main dial. The idea of introducing a ball bearing made from aventurine in the top part of the case adds volume and depth and you can roll the ball around with your finger. Another pleasant detail, designed to emphasise the curvaceous and sensual shape of the case, is the way the ribbon of diamonds hugs the contours of the case tapering gently in size as they progress down the bezel towards the crown. The hour and minutes hands are crafted in 18k white gold and the hour, and minute track is composed of a circular grain motif to match the starry background. 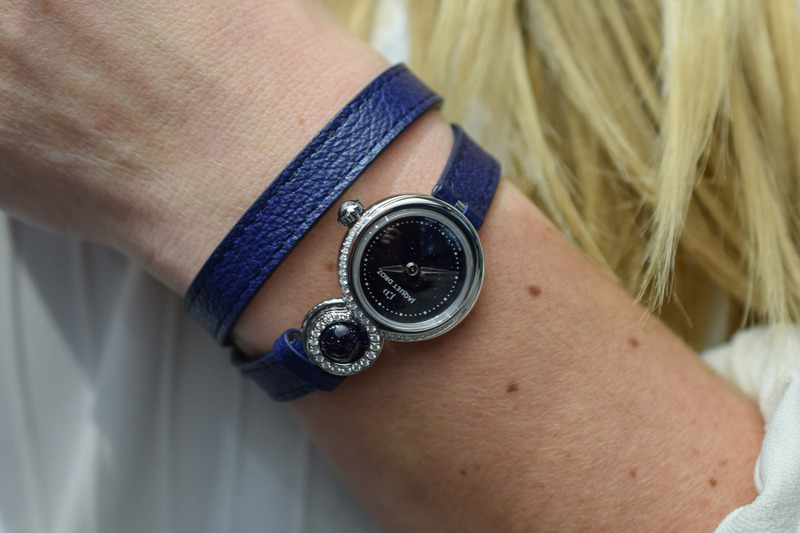 The saddle-cut double tour blue calf leather strap comes with a stainless steel ardillon buckle set with a further 23 diamonds. 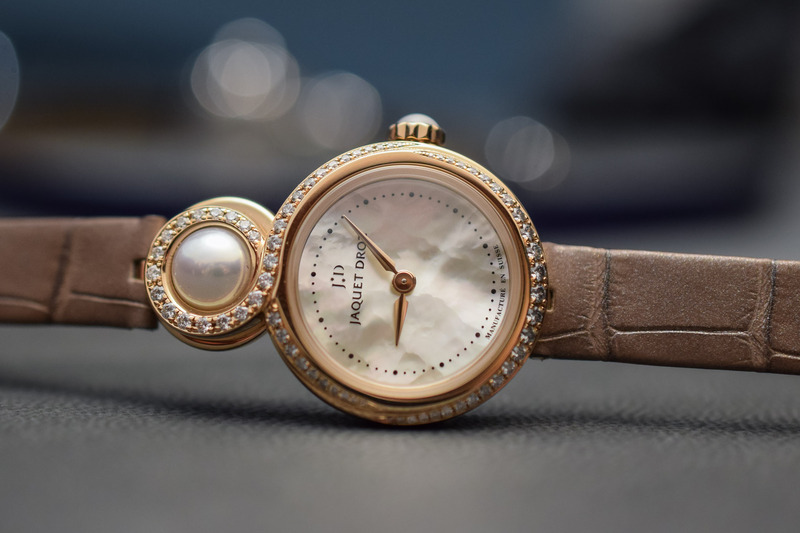 A more luxurious take on the Lady 8 Petite is this 18k red gold model glowing with a total of 91 brilliant-cut diamonds and a mother-of-pearl dial. 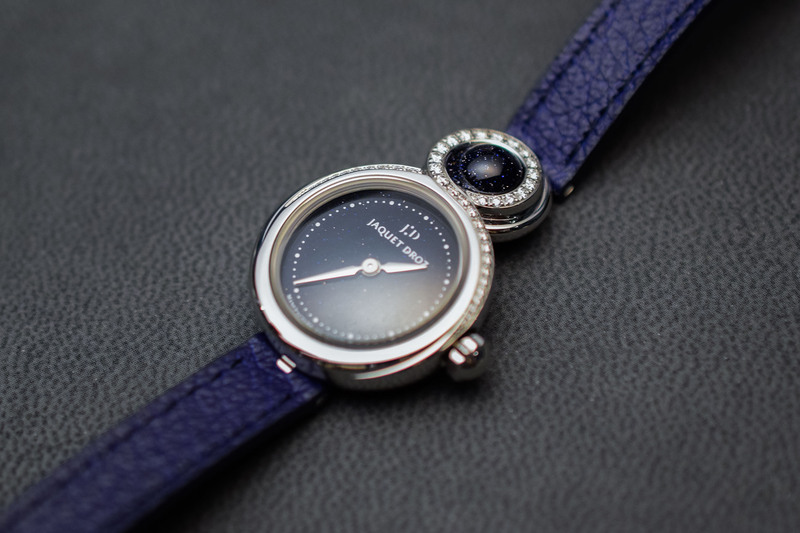 Feminine to the core, the Lady 8 Petite Mother-of-Pearl model taps into the ongoing vogue for shimmering nacre dials that glow with natural iridescence. The scenery of fluffy clouds created by the mother-of-pearl on the dial is topped by a glowing (and rolling) Asian Akoya pearl, and the crown, as you might expect, is set with a mother-of-pearl cabochon. More opulent than her aventurine sister, this model features a total of 68 brilliant-cut diamonds that taper around the contours of the case with an additional 23 diamonds set on the red gold ardillon buckle on the single taupe alligator strap with no stitching. Both watches feature an exhibition caseback for a view of the mechanical self-winding movement – calibre Jaquet Droz 615 – with a 38-hour power reserve, a frequency of 21,600vph and a silicon balance spring and pallet horns. In pride of place, the fan-shaped rotor – in red gold or stainless steel – displays the scalloped guilloché engraving and the brand’s logo in the shape of two stars. Available in five variations, the red gold version retails for EUR 27,000 and the stainless steel model for EUR 15,900. 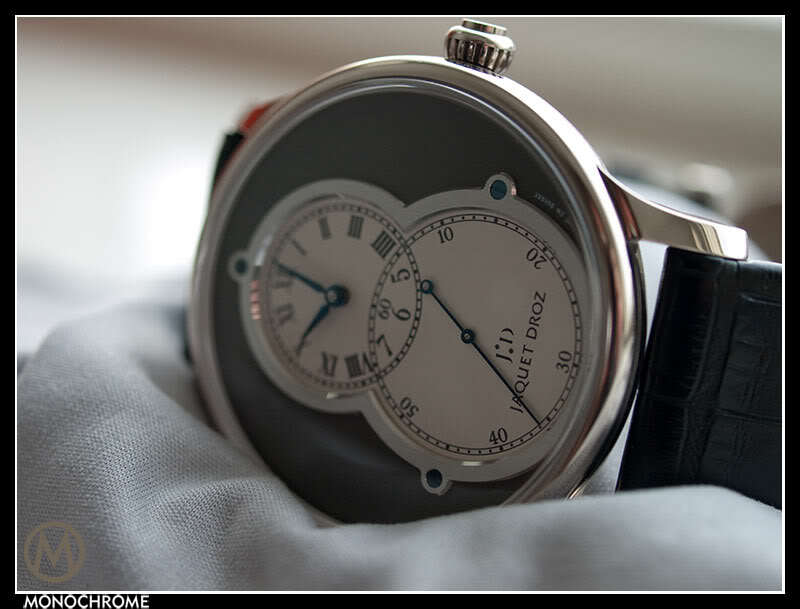 For more information on all five models, please consult www.jaquet-droz.com.